We just recently received a tip from one of our readers (credited below) about benchmarks that have been interpolated from Raw Data, giving relatively accurate reading of what to expect from Maxwell. Editor’s Note: These are NOT real life benchmarks, but rather emulated and interpolated from present data. Real Life benchmarks may and probably will vary atleast a little. That said the benches should be less than 5% off at most. Editor’s Note + : The authencity of these benches is dubious in nature, so treat these at face value. We wont however pull the news. 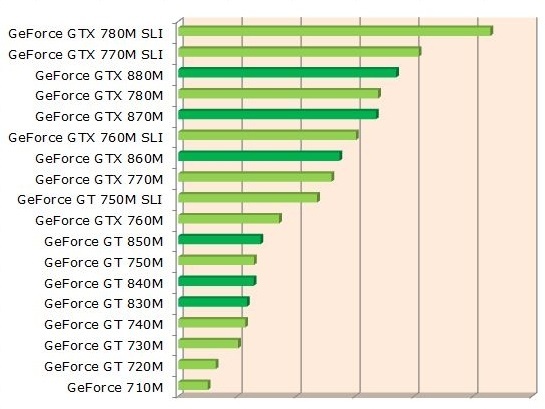 Nvidia GeForce 800 Mobility ‘Maxwell’ Benchmarks compared with Nvidia 700 Mobility Series. Details about Maxwell’s Mobility series surfaced a few days back and now predicted benchmarks have also surfaced. Without further ado here are the benchmarks. Sadly the chart is lacking in any details on what logic was used in interpolating the data, however the graph appears to be more or less what we expect Maxwell to be like. If i had to wager i would say that this chart is a mixture of data from the Clevo slides and actual insider information. From the graph we can deduce the following: The 750m and 840m will be the same silicon, as will 780 and 870. That said most of the Maxwell series will be re brands anyway, with only the flagship and some odd cards here and there having the new architecture. Interestingly the 880M is only slightly behind an 770M SLI which would be something to be very happy about if we knew the Power Consumption. Dual Cards will drain your laptop battery in no time, but a single card offering only slightly less performance would definitely be the way to go. Ofcourse i am going with the assumption that the 880M will consume significantly less than the 770M SLI Configuration, which is probably true. Nvidia would also most probably release a 880M SLI Configuration which would be the king of mobile graphics for a year or so. Ofcourse why you are going with a 880M SLI Configuration on a laptop Luggable and not just getting a desktop is beyond us.